The Hateful Eight is “The 8th Film by Quentin Tarantino”, we are informed by the opening credits, just in case anyone is struggling to keep count. 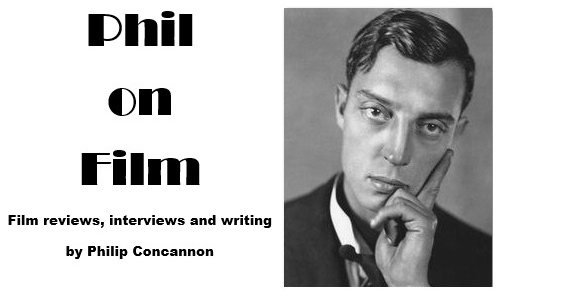 Has any working director, in the prime of their career, ever been so fixated upon their own legacy? Tarantino has already informed us that he is aiming to retire after completing ten features, so with the clock on his career apparently ticking, every Tarantino film feels like an event, never more so than The Hateful Eight, which is being presented very deliberately as a rare cinema event. Harkening back to a bygone age of film presentation, Tarantino has used his clout with The Weinstein Company to produce a 'roadshow version' of his new film, projected in the 2.76:1 Ultra Panavision ratio on 70mm prints, complete with an overture and intermission. The style of presentation might be a throwback, but the type of film that Tarantino has produced is not in keeping with previous uses of this format. Ultra Panavision 70 is associated with grand and overblown Hollywood epics like Khartoum, How the West Was Won and It's a Mad, Mad, Mad, Mad World, but while The Hateful Eight opens with images of snowy mountain vistas, across which a small stagecoach is rapidly trying to outrun a blizzard, much of it takes place in the cramped confines of an isolated cabin known as Minnie’s Haberdashery. This is where a disparate group of cannily chosen character actors will take shelter from the storm and size each other up. The cast list reads as follows: Major Marquis Warren (Samuel L. Jackson), a former Union soldier turned bounty hunter, and John ‘The Hangman’ Ruth (Kurt Russell), another man in the same line of work who is determined to bring his chained captive Daisy Domergue (Jennifer Jason Leigh) to her date with the gallows. But will they make it out of here in one piece? Both Warren and Ruth start eyeing the strangers in the cabin with suspicion. There's an Englishman (Tim Roth) who claims to be Red Rock’s new hangman and racist rebel Chris Mannix (Walton Goggins), who says he is the town's new sheriff, but is anyone here who they say they are? There are less forthcoming characters too - notably a retired Confederate General (Bruce Dern) and a taciturn cowboy (Michael Madsen) - and there's the stagecoach driver O.B. (Michael Parks), who brought Warren and Ruth to Minnie's. This driver probably has as much screentime as the actors who adorn the poster, but I guess he isn't hateful enough to make the cut. The rest of them are pretty hateful, however, and we can hardly be surprised when trigger fingers start to itch and the blood starts to flow, but aside from the punishment occasionally inflicted upon Daisy, much of the first half is a surprisingly quiet affair. The Hateful Eight is a distinct film of two halves, with the key inciting incident being placed just before the intermission, an act of verbal aggression in which Major Warren uses his facility as a storyteller to gain the upper hand over another character and provoke him into a response. “You’re seeing pictures, ain’t ya?” he says with a grin as his words permeate his victim’s brain. Tarantino’s dialogue may not feel as fresh or exciting as it did when he exploded onto the scene in the 1990s, but the long conversations in his films can still exert a mesmerising pull. All of the characters in The Hateful Eight are conscious of the power of storytelling, they all have secrets or identities that they mean to keep concealed, and Tarantino takes great pleasure in letting his words flow while simultaneously charting the shifting power dynamics within the group and ratcheting up the tension. Tarantino and his cast famously performed an early version of this script as a live read and he has spoken of the potential for bringing The Hateful Eight to the stage, and there is something theatrical about the ornate, discursive, rhythmic language being used here, particularly in the compelling monologues. But what you would lose on stage is the way Tarantino and his cinematographer Robert Richardson turn this potentially flat setup into something cinematic. They quickly establish Minnie’s Haberdashery as a fully realised space to be explored, and they keep the frame alive by placing characters strategically in the background or to the extreme edges of the extra-wide frame. It may seem a perverse move to use a 70mm format associated with sweeping epics for such an interior film, but like Paul Thomas Anderson – who adopted a similar approach with The Master – Tarantino understands and values the power of his actors. Close-ups of Jackson and Leigh in particular have a bracing immediacy, with the latter’s performance of a ballad providing one of the film’s most indelible and unexpectedly lyrical moments. Such moments are scarce in the second half of The Hateful Eight. Blood is spewed forth, heads explode and limbs are hacked off as the tension developed and sustained throughout the first act gives way to outrageous acts of violence, although I confess I enjoyed the setup a lot more than the execution. The violence here feels oddly rote, particularly in Tarantino’s use of slow-motion, and most of it lacks the startling impact intended. Perhaps my apathy towards these elements of the film are rooted in my frustration that this kind of carnage seems to be the only way Tarantino can write himself out of a corner (although if the alternative is to interject with some arbitrary narration on the soundtrack, as he does a couple of times here, perhaps I shouldn’t gripe too much). I was also thrown by the positioning of a flashback four-fifths of the way into the film, which doesn’t serve much purpose aside from introducing the one performance in the film, from Channing Tatum, that doesn’t work, as well as a host of unconvincing characters whose sole purpose is to be slaughtered. The more uneven and frustrating passages in the second half of The Hateful Eight gave me time to consider what exactly Tarantino is trying do with the film. It is set up as a parable of racism in America, set immediately after the Civil War but speaking to our times, but I’m not sure he does anything particularly interesting or conclusive in this area. 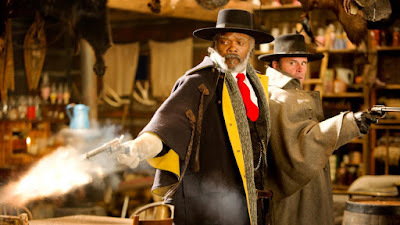 The film opens with an image of a black and white horse pulling the stagecoach side-by-side and closes with two racially opposed characters working in tandem, while the script features lines like “The only time black folks are safe is when white folks is disarmed” or “When niggers are scared, that's when white folks are safe”, but it feels like Tarantino’s ideas in this department have gotten away from him or have only been half-developed, and they more often appear as little more than slightly tired provocations. A couple of nights after watching The Hateful Eight I attended a screening of Jackie Brown, Tarantino’s 1997 film, which now feels like an odd and increasingly valuable outlier in his career. I was reminded of the nuance and compassion that he and his actors brought to that adaptation of Elmore Leonard’s novel. It was a film about real people, set in a recognisable world, that didn’t delight in carnage or thirst for revenge, and as my thoughts wandered during some of The Hateful Eight’s longueurs, I lamented the fact that we’ll probably never see another comparable film from him. The Hateful Eight is one of Tarantino’s most audacious pictures in many ways, and it’s often brilliant, but there’s also a deadening predictability about many of the choices he makes as the film nears its climax. Tarantino doesn’t seem to understand that the directors he reveres and constantly talks about spent their careers working in multiple genres and modes without worrying about how each feature fit into the narrative of their filmography. The Hateful Eight may be the kind of film that only Quentin Tarantino could make, but is it the only kind of film that he can make? Let’s hope for something new in number nine.